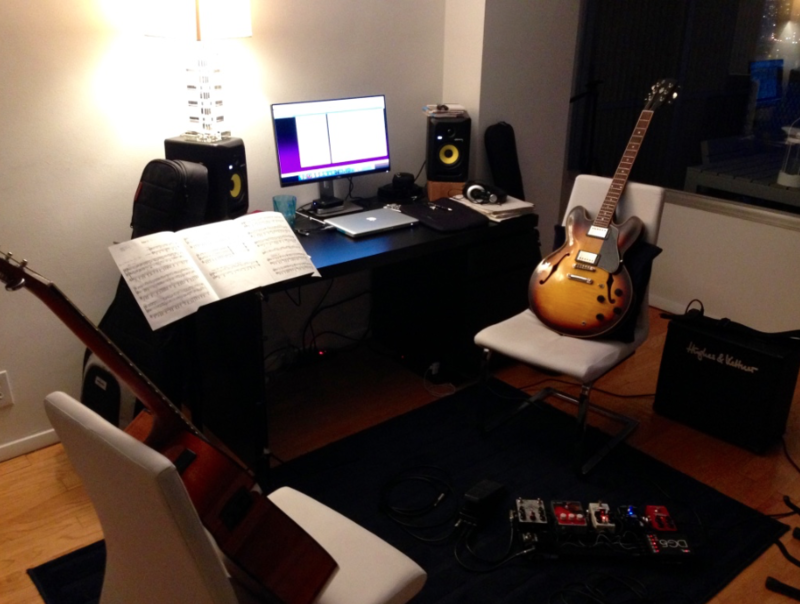 Besides my activity as a guitarist, composer, and improviser, I’m also very active as an educator in the NYC metropolitan area, working as guitar instructor for different music schools as well as teaching privately. I take pleasure in inspiring my students to share my excitement and enthusiasm for guitar and music. I am very passionate about helping students achieve their goals and aspirations. Apart from applying the pedagogical approaches common to standard music education, I also employ my own personal teaching philosophy that focuses on helping my students find their voice on the instrument, enabling them to question everything they learn and think for themselves. By dissecting the fundamentals of music and guitar into small reachable but challenging goals, I make learning an engaging, fun, and rewarding process. I am also regularly adapting my approach based on the students’ progress. I am confident that after just one lesson, whether you’re a complete beginner or want to take your guitar playing to the next level, you will see that my teaching approach will help you reach your whole potential. Lessons are taught in person but also via Skype or Facetime, and students from instruments other than guitar are welcomed too. The website Thumbtack awarded me with “Best Guitar Instructor” in the NYC metropolitan area in 2015 and 2016. “I have been extremely fortunate to have found Álvaro as a guitar/music instructor. Within 2 minutes of meeting him you can see the passion for life and music flowing out of him. He has a natural gift of meeting you wherever you are on the path of your musical journey, and inspiring you to move forward. For years I have been stuck in the same old rut practicing the same old things, getting better, but it seemed so slowly. Within 3 lessons my playing, and understanding of music grew faster than 6 months of practicing on my own. Álvaro molds your lesson around who you are. He has a way of coaxing emotional content out of your playing. If you are looking for a guitar/music instructor look no further. Teachers of this caliber, talent, and demeanor are few and far between.” Ken. “I cannot say enough about Álvaro. First of all, I have been practicing on my own for about 4 years and have had experience with other teachers. I chose Alvaro to give me a strong musical base to become a professional musician, because he is by FAR the most knowledgeable and experienced teacher I’ve ever encountered. And I shopped around with several teachers for a while! Álvaro is simply the best teacher I’ve come across for many reasons. First of all, his playing is sublime. But what makes Álvaro so exceptional are his personal attributes, especially his genuine care and passion to make you a better player. I came to him with goals, and not only did he meet me fully with my ambitions, but he encouraged me to go beyond them! He immediately began charting out a logical roadmap of HOW he will work with me to get there and also go beyond. He is someone you can absolutely trust to give you correct information and constructive, purposeful feedback. He cuts through the BS and conflicting information/opinions you find in the guitar universe, and tells you very simply WHAT is correct and WHY it is correct. If you are interested in guitar as a hobby or as a profession, you, like me, will want to be able to have faith in the instructor; otherwise, you could be wasting time learning from a teacher who could be making your playing worse! “I am seeing Álvaro for guitar lessons. I’ve been playing for many years, but never had the training or clear understanding of what I needed in order to achieve my goals.